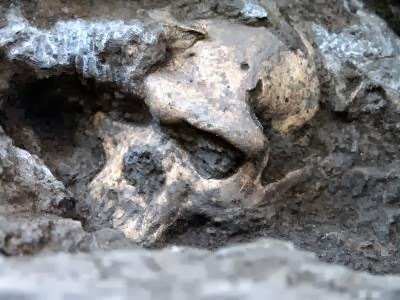 The site of Dmanisi, Georgia, has yielded an impressive sample of hominid cranial and postcranial remains, documenting the presence of Homo outside Africa around 1.8 million years ago. Here we report on a new cranium from Dmanisi (D4500) that, together with its mandible (D2600), represents the world's first completely preserved adult hominid skull from the early Pleistocene. D4500/D2600 combines a small braincase (546 cubic centimeters) with a large prognathic face and exhibits close morphological affinities with the earliest known Homo fossils from Africa. The Dmanisi sample, which now comprises five crania, provides direct evidence for wide morphological variation within and among early Homo paleodemes. 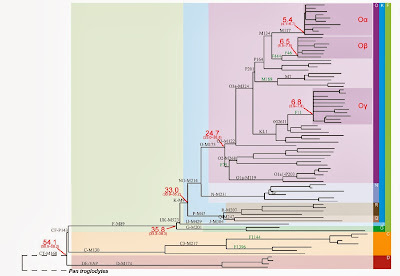 This implies the existence of a single evolving lineage of early Homo, with phylogeographic continuity across continents. An interesting new paper on the arXiv. The title focuses on three star-like Neolithic expansions that account for ~40% of the modern Chinese. From ~3 men to ~270 million male descendants over ~6,000 years ain't too shabby. recently, Wei et al. 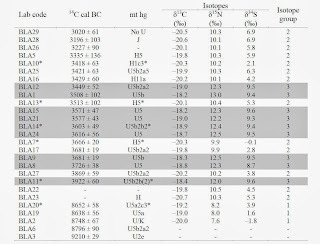 published a similar study about Y chromosome sequencing of 36 individuals (mainly Haplogroup R1b and E1b), in which 3.15 or 8.83 Mbp range was sequenced 19, and they achieved a time of out-of-Africa at 57 – 74 kya using various methods, which is slightly older than our result (54 kya), although the same mutation rate of 1×10-9 substitution/base/year were employed. The difference could be ascribed to the regions chosen for date estimation; we compared the regions that Wei et al. and we studied, and found that in their study, the SNP density in the region that was sequenced only in their study is significantly higher than that in the region that both studies have sequenced (P less than 0.005) (Table S3). It remained mysterious that how many times the anatomically modern human migrated out of Africa, since that among the three superhaplogrous C, DE and F, Haplogroup F distributes in whole Eurasia, C in Asia and Austronesia, D exclusively in Asia, while D’s brother clade E distribute mainly in Africa 62, so there are two hypotheses, 1) haplogroups D and CF migrated out of Africa separately; 2) the single common ancestor of CF and DE migrated out of Africa followed by a back-migration of E to Africa. From this study, the short interval between CF/DE and C/F divergences weakens the possibility of multiple independent migrations (CF, D, and DE*) out of Africa, and thus supports the latter hypothesis 63 (Fig. S2 a). I have argued for haplogroup E back-migration into Africa before in this blog, so it's nice to see that this idea is gaining some supporters. 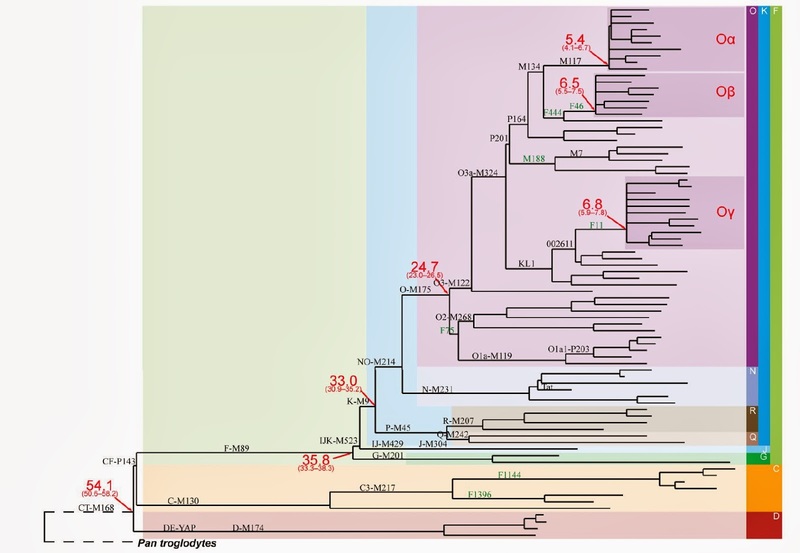 A previous article had determined that Napoleon I had belonged to Y-haplogroup E-M34*, and a new one designates his haplogroup as "M123+, M34+, and L791 and L792+," and determines a multi-STR haplotype for his lineage based on two patrilineal relatives. 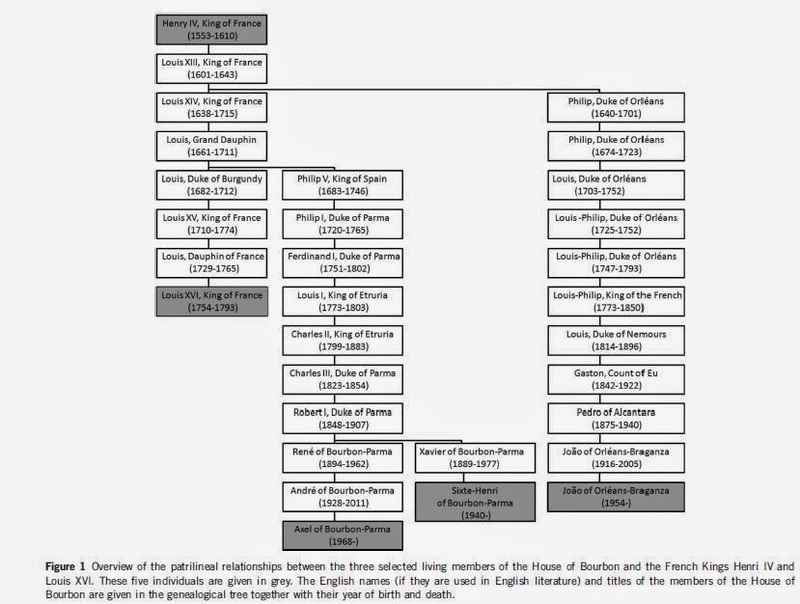 Such a well-resolved haplotype may now make it possible to both (i) find descendants and relatives of Napoleon that may be unaware of this connection, and (ii) to more precisely determine the ultimate origins of the house of Buonaparte. As part of the Napoléon I Genome (NIG) project we have reconstructed, based on more than one hundred Y-STRs (Y-short tandem repeats), the complete Y-haplotype of the non-recombinant part of the Y-chromosome (NRY) of French Emperor Napoléon I (1769-1821). We already knew the allelic values at Y-markers of the Y-chromosome of Napoléon I, but only for the palindromic STR YCAIIa and b and for the non-palindromic Y-STR DYS19. The present reconstruction aims to compare the allelic values at Y-STRs of the DNA of Charles Napoléon (C.N. ), the living 4th generation descendant of Jérôme Bonaparte (Napoléon I’s youngest brother), with those of Alexandre Colonna Walewski (A.C.W. 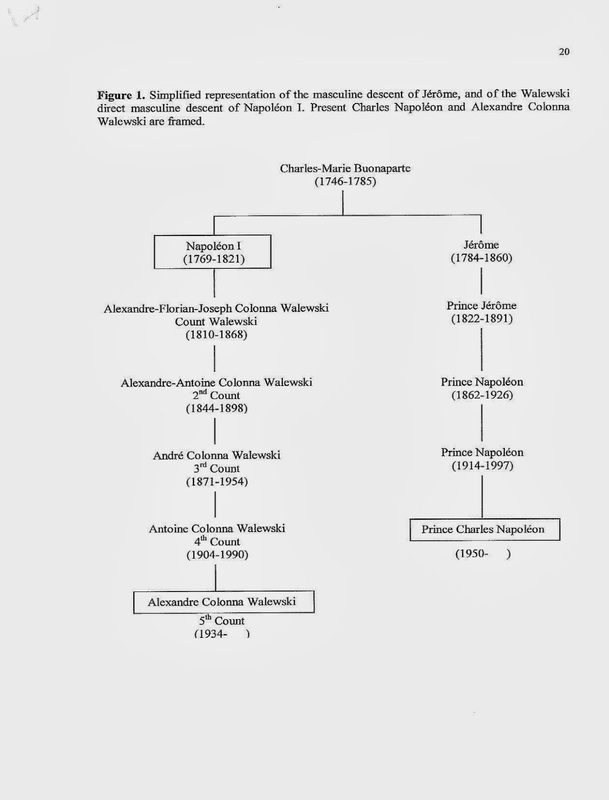 ), the living 4th generation descendant of Count Alexandre Walewski (the son born of the union between Napoléon I and Countess Maria Walewska). We have previously established that Napoléon I, C.N. and A.C.W. are of the same Y-haplogroup E1b1b1b2a1. The allelic values for C.N. and A.C.W. 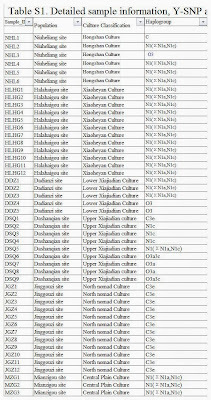 are the same for ninety-three other non-palindromic markers (belonging to ninety different STRs) and for thirty-eight other palindromic markers (belonging to fifteen different STRs); these values then constitute those deduced in the reconstruction of the allelic values of the STR markers of the Napoléon I’s Y-haplotype. Four non-palindromic STRs and two palindromic STRs have different allelic values in C.N. and A.C.W. ; we have deduced the allelic value of Napoléon I for one (DYS454), and the probable allelic values for two (Y-GATA-C4 and DYS712) of these non-palindromic variable STRs. To sum up, we have established, by reconstruction of the lineage, the allelic values of the markers of Napoléon I’s Y-haplotype for a total of one-hundred and thirty-three different Y-STR markers. I added the results in my compendium. Two important new papers appeared in Science today. In the first one (Brandt, Haak et al. ), researchers compiled mtDNA results from 364 prehistoric central Europeans from the early Neolithic to the early Bronze Age, spanning about four millennia of history. 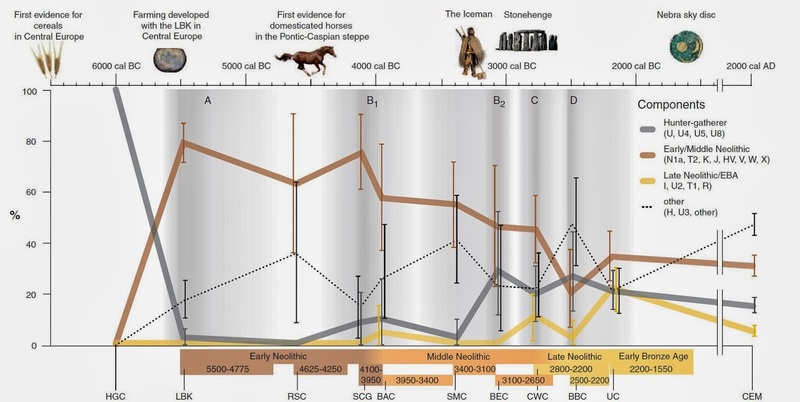 Importantly they uncover not a smooth transition between early Neolithic farmers and modern Europeans, but a punctuated series of haplogroup frequency changes that cannot really be explained by genetic drift in a single European population evolving over time. Hopefully this kind of research can be repeated in other parts of the world, as it provides a way to see evolution and migration as it happens. Earlier work has disproved the hypothesis that modern Europeans are simply "acculturated" hunter-gatherers, and this newer research disproves the idea that they are simply the descendants of early farmers, little modified since the beginning of the Neolithic. I am sure that myself and others will spend some time trying to digest the wealth of information present in the paper and its supplementary materials. Yet, one conclusion can already be made, that migrationism is alive and well. Anyone adhering to a "pots not people" paradigm will find difficult to explain the sharp discontinuities found in the genetic record. European foragers contrast with the earliest farmers, who, in turn, contrast with and the Late Neolithic copper cultures that supplanted them a few thousand years later and spawned the Bronze Age world. If pots aren't people, it's strange that archaeological cultures defined largely by pots (right) also appear to mark genetic contrasts. You may follow the grey line to see how central Europe, once populated exclusively by hunter-gatherers, experienced a virtual disappearance of their matrilineages for almost two thousand years after the advent of farming. Then, between the Middle to Late Neolithic, around five thousand year ago, the hunter-gatherers make their re-appearance before their lineages converge to their modern (minority) frequency. The authors present a model of migration to explain these events, illustrated in a movie in the supplementary material, and also in the figure on the left. 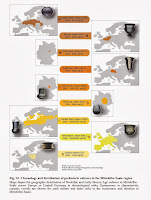 I note the European-ness of Bell Beaker (probably due to elevated frequencies of haplogroup H) and the eastern European-ness/west Asian-ness of Corded Ware/Unetice. 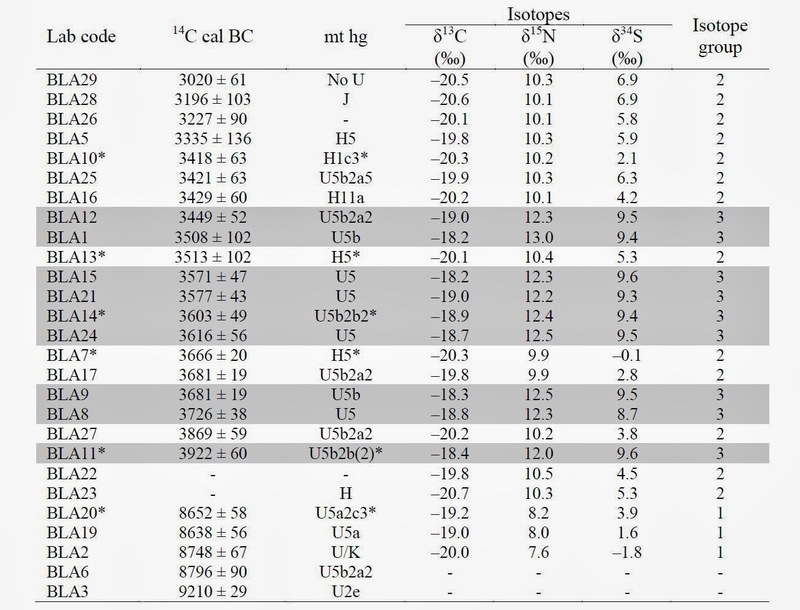 In summary, the results of 14C and stable isotope analysis, together with the DNA evidence, suggest that the Blätterhöhle individuals are sampled from three distinct populations: (i) Mesolithic hunter-gatherers, (ii) Neolithic farmers, and (iii) Neolithic fisher-hunter-gatherers (special-izing in freshwater fish). The latter two notably date to the fourth mil-lennium BC, which is around 2000 years after the introduction of farming to Central Europe. I was reminded of an older paper about first contact between farmers and hunter-gatherers. An important consequence of the second paper is that hunter-gatherer lineages in modern Europeans may have come not only from outlying areas where foragers persisted in greater numbers, but also from within the farming realm itself. Guido Brandt, Wolfgang Haak et al. 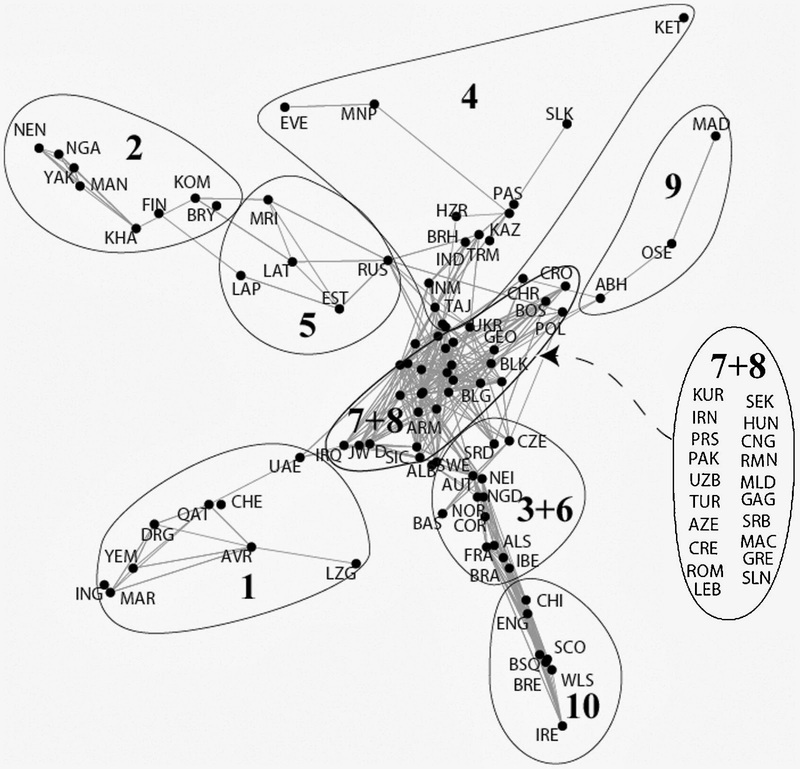 The processes that shaped modern European mitochondrial DNA (mtDNA) variation remain unclear. 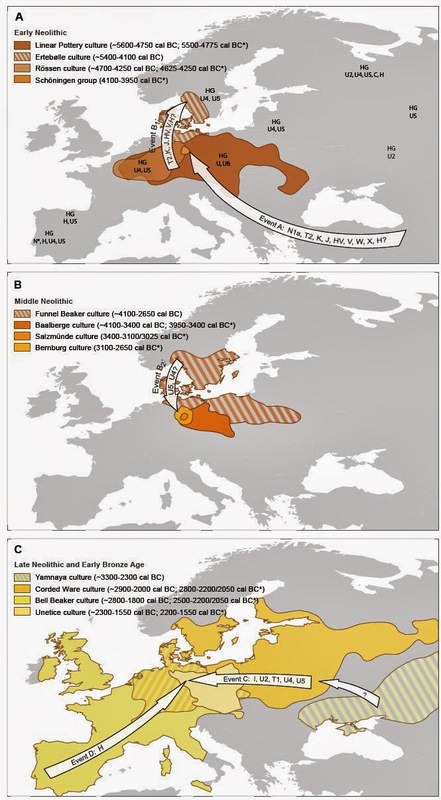 The initial peopling by Palaeolithic hunter-gatherers ~42,000 years ago and the immigration of Neolithic farmers into Europe ~8000 years ago appear to have played important roles but do not explain present-day mtDNA diversity. We generated mtDNA profiles of 364 individuals from prehistoric cultures in Central Europe to perform a chronological study, spanning the Early Neolithic to the Early Bronze Age (5500 to 1550 calibrated years before the common era). We used this transect through time to identify four marked shifts in genetic composition during the Neolithic period, revealing a key role for Late Neolithic cultures in shaping modern Central European genetic diversity. Thus concludes a new study which conflicts with the identification of blood from a handkerchief presumed to be from the execution of Louis XVI and the presumed head of Henri IV. It is nice that this study was made possible by the co-operation of three patrilineal Bourbon descendants. 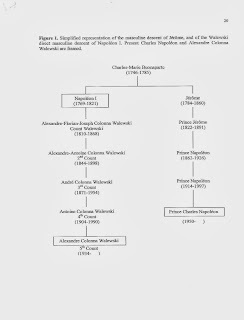 I've mentioned before that the European nobility is an untapped resource for historical/genetic studies, as they can often document much longer lines of descent than most others, so it's good to see that at least some descendants of kings are willing to contribute to this kind of research. Maarten H D Larmuseau et al. Genetic analysis strongly increases the opportunity to identify skeletal remains or other biological samples from historical figures. However, validation of this identification is essential and should be done by DNA typing of living relatives. Based on the similarity of a limited set of Y-STRs, a blood sample and a head were recently identified as those belonging respectively to King Louis XVI and his paternal ancestor King Henry IV. Here, we collected DNA samples from three living males of the House of Bourbon to validate the since then controversial identification of these remains. 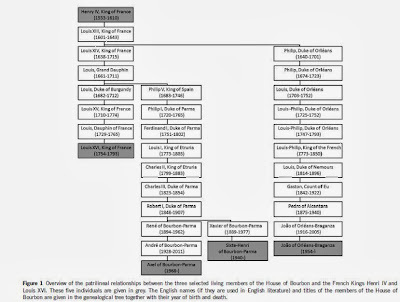 The three living relatives revealed the Bourbon’s Y-chromosomal variant on a high phylogenetic resolution for several members of the lineage between Henry IV and Louis XVI. This ‘true’ Bourbon’s variant is different from the published Y-STR profiles of the blood as well as of the head. The earlier identifications of these samples can therefore not be validated. 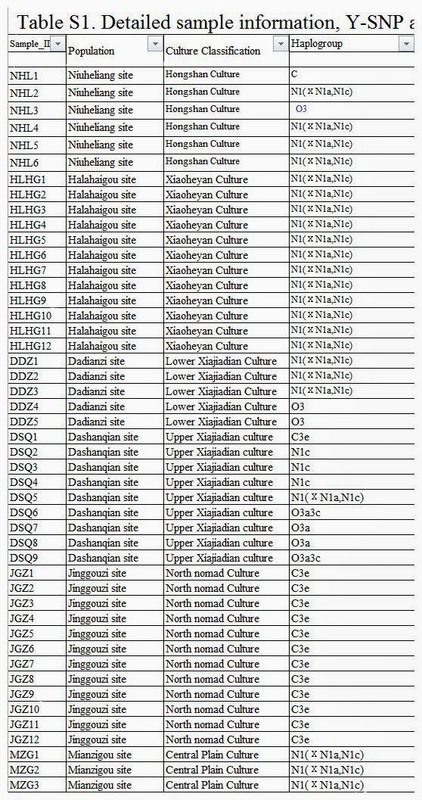 Moreover, matrilineal genealogical data revealed that the published mtDNA sequence of the head was also different from the one of a series of relatives. This therefore leads to the conclusion that the analyzed samples were not from the French kings. Our study once again demonstrated that in order to realize an accurate genetic identification of historical remains DNA typing of living persons, who are paternally or maternally related with the presumed donor of the samples, is required. 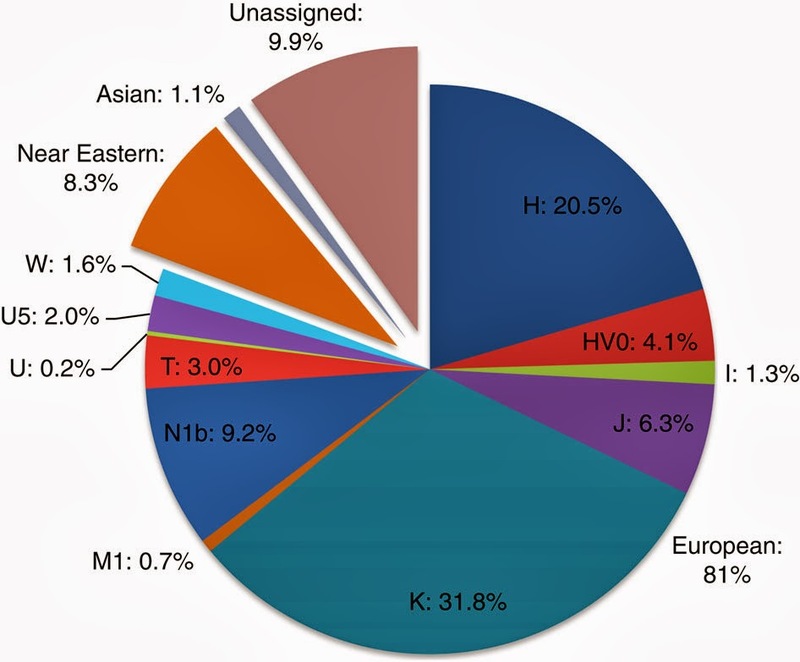 If we allow for the possibility that K1a9 and N1b2 might have a Near Eastern source, then we can estimate the overall fraction of European maternal ancestry at ~65%. Given the strength of the case for even these founders having a European source, however, our best estimate is to assign ~81% of Ashkenazi lineages to a European source, ~8% to the Near East and ~1% further to the east in Asia, with ~10% remaining ambiguous (Fig. 10; Supplementary Table S9). Thus at least two-thirds and most likely more than four-fifths of Ashkenazi maternal lineages have a European ancestry. Marta D. Costa et al. The origins of Ashkenazi Jews remain highly controversial. Like Judaism, mitochondrial DNA is passed along the maternal line. Its variation in the Ashkenazim is highly distinctive, with four major and numerous minor founders. However, due to their rarity in the general population, these founders have been difficult to trace to a source. 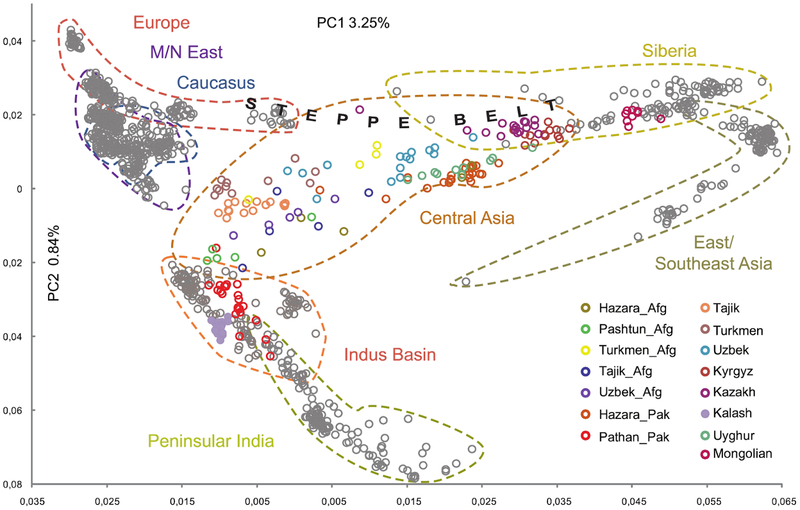 Here we show that all four major founders, ~40% of Ashkenazi mtDNA variation, have ancestry in prehistoric Europe, rather than the Near East or Caucasus. Furthermore, most of the remaining minor founders share a similar deep European ancestry. 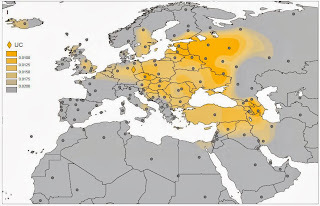 Thus the great majority of Ashkenazi maternal lineages were not brought from the Levant, as commonly supposed, nor recruited in the Caucasus, as sometimes suggested, but assimilated within Europe. These results point to a significant role for the conversion of women in the formation of Ashkenazi communities, and provide the foundation for a detailed reconstruction of Ashkenazi genealogical history. 'Over 3800 years ago, a young male, possibly born in Skåne, made a journey of over 900 kilometers south, to Wroclaw in Poland. He died violently in Wroclaw, killed by Úněticean farmers, possibly due to romance with two local females, who were murdered together with him. This 'Bronze Age love story', with no happy end today is the first case of Swedish-Polish contacts in history ever', concludes archaeologist Dalia Pokutta, author of the thesis. Here is the thesis, titled: Population Dynamics, Diet and Migrations of the Únětice Culture in Poland. It is particularly important to note that the bust following the initial farming boom is found in two historically separate agricultural expansions, the first into Central Europe c. 7,500 years ago and the second into Northwest Europe 1,500 years later. It is possible that some of these regional declines represent out-migration to neighbouring areas rather than a real decline in numbers, for example, from the Paris Basin into Britain, but, in some cases, for example, Ireland, Scotland and Wessex, it is very clear that the rising and falling trends are roughly synchronous with one another—there is little indication of one going up as the others go down. On present evidence the decline in the initially raised population levels following the introduction of agriculture does not seem to be climate-related, but of course this still leaves open a variety of possible causes that remain to be explored in the future. One possibility is disease, as the reference to the Black Death above implies, although this would have to be occurring on multiple occasions at different times in different places, given the patterns shown. It is perhaps more likely that it arose from endogenous causes; for example, rapid population growth driven by farming to unsustainable levels, soil depletion or erosion arising from early farming practices, or simply the risk arising from relying on a small number of exploitable species32. However, these suggestions remain speculative and an autocorrelation analysis of the demographic data did not find evidence of a cyclical pattern, which would be one indicator of the operation of endogenous processes (Supplementary Fig. S7). Regardless of the cause, collapsing Neolithic populations must have had a major impact on social, economic and cultural processes.